When a business first decides to use a double entry bookkeeping system it needs to record an opening entry in the ledger using the general journal. The opening entry will vary from business to business depending on the contents of its opening balance sheet. Suppose a business has been in operation for a number of years and has decided to start operating a double entry bookkeeping system. Using its current accounting records which are kept on a single entry basis, it determines that its assets and liabilities are as follows. The owner of the business has injected capital amounting to 6,000 when the business started and the retained earning to date are calculated as follows. The opening entry can now be recorded in the ledger using the general ledger journal. The opening balance entry is as follows. The journal records the assets, liabilities and equity of the business in the general ledger as opening balances. Subsequent transactions for the accounting period can now be entered in the usual manner. The accounting equation, Assets = Liabilities + Equity means that the total assets of the business are always equal to the total liabilities plus the equity of the business. This is true at any time and applies to each transaction. 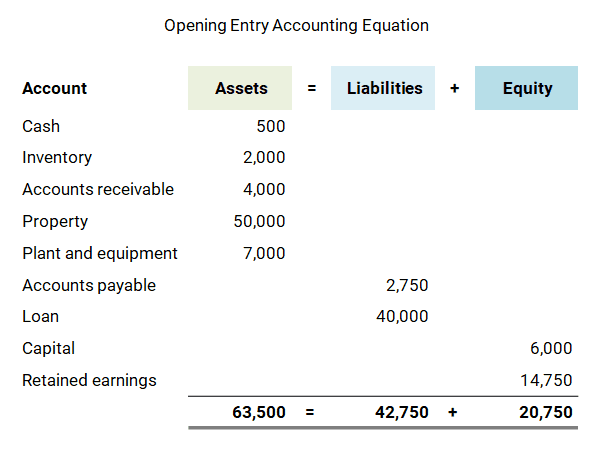 For this opening entry transaction the accounting equation is shown in the following table. On the left hand side of the accounting equation the assets increase by 63,500. This is matched on the right hand side by an increase in liabilities of 42,750, an increase in equity of 20,750. A specific example of an opening journal entry is that of a new business formed by a founder purchasing shares for cash. Suppose the founder starts a new business with an opening share capital of 100. To purchase the shares the founder must pay the business 100 in cash. The opening journal entry for the new business is as follows. Following the transaction the equity (share capital) of the business will increase by 100. This increase is matched by a corresponding increase in the assets (cash) of the business. Although these entries relate to the setting up of a double entry bookkeeping system, similar entries will be used at the start of each new accounting period when the balances on the permanent accounts are brought forward from the previous accounting period. The opening entry journal is one of many bookkeeping entries used in accounting, discover another at the links below.